Airstream has long been known for best-in-class travel trailers and traveling opportunities. Therefore, it was a no-brainer for couple Martin Readman and Annie Jomphe from design and construction company Sitka Concept Incorporated to renovate one as their very own house on wheels. While it was no easy feat to create a functional 200 square-foot home they could comfortably live in with three children, Martin and Annie made it work. They planned to use sustainable materials while aiming for minimalism and a boat-style design. 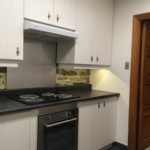 The kitchen is entirely functional, albeit small. Above the bench sits dry storage mason jars which are effortless for the cook to access. There is also everything you need to cook up a storm, including a sink, fridge, propane range, and a dining booth. Adjacent is the wood stove which functions as a source of heating in the colder months. There are even two adjustable benches to create more seating or storage and stylish curtains and cushions to seal the deal. Mason jars line the kitchen, providing convenient access to staple items. The wood stove adds ambiance as well as warmth during the winter months. 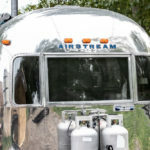 Catering for three kids in a confined space is a challenge, but the Airstream delivered. The center of the trailer features three bunk beds, storage, batteries, electric components, the inverter, as well as the washing machine. The kids also get to enjoy baskets for toys, cupboards for clothes, and bookshelves. It’s a snug fit, but a comfortable one for the smaller members of the family. Annie and Martin’s bedroom is something special too, with a double bed, cabinetry, and a full outdoor view. There are also drawers and plenty of under-bed storage too. 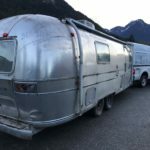 You would think there would be no room left – but the Airstream even has space for an office – home to computers, paperwork and electronic components. The bathroom features a composting toilet, cabinets, cedar touches, ceramic tiles, LED lighting and a propane water heater. The bathroom boasts contemporary elegance and a boat-like style. The full shower is spacious and easy-care with ceramic tiling.